Acne is incurable, but it doesn't mean you will be having acne throughout your life. There are so many acne treatments, proven effective and available. As I shared acne myth and facts with you in my late blog posts. 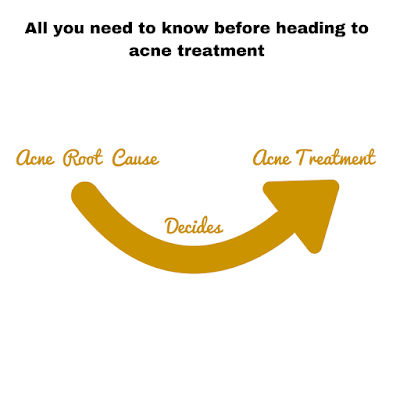 Once you take your acne problem to the doctor, he or she will ask for medical history or since how long you facing this acne issue and will try to diagnose the type of Acne. 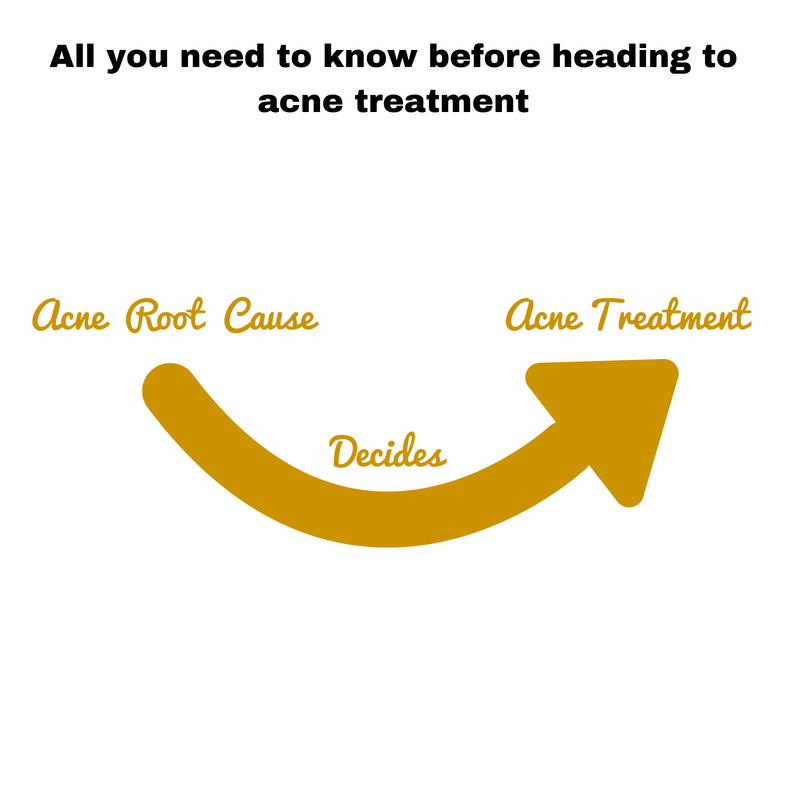 Treatment of acne differs on the basis of a type of your acne and etiology. Without eliminating the cause of your acne condition, you will never get rid of your acne. We the humans are exposed to many toxins(crap) in a day. Our body starts to load with toxins internally as well as externally through many ways. The body gets rid of these through an elimination process via organs like liver, the lungs, kidneys, the colon, the skin which supports the elimination. Kidneys are the main organ plays important role in the elimination of toxins. The liver cleanses the blood and send the toxins to the kidney for further filter and get excreted from the body through urine or stool. When both kidney and liver did their work and if get overloaded they send the toxins to the skin. Skin releases toxin through sebum and sweats. The mixture of bacteria, sebum and sweat blocks the skin pore, makes the skin inflamed from inside and some other causes of acne are infections. Treatment of acne with medicine nowadays is they are not treating the root cause of acne instead providing superficial relief from the symptoms of acne. Some of the medicine gives a dry skin by suppressing the oil gland and underneath the bacterial infection. Acne appearance takes place where Hormonal irregularities + Genetic tendencies + Toxins load = Acne; when either of these or all these exist in the body. For teenagers acne, mainly hormone disturbance is responsible, whereas in adults acne can be due to their genetic appearance or toxin build up. Unfortunately, genetics are not under your control and controlling bodies hormonal change is very difficult. Thankfully, toxin build-up is one of the main reason that contributes to acne can be controlled. Always keep in mind that what may work for one person but that same treatment may not work for others. of acne for that person. Acupuncture not only treats acne but also proven beneficial for stress management, relaxing body, menstrual irregularities, and other conditions like nausea, vomiting, etc. where it may be useful as an alternative treatment option, since ages. Acupuncture in India Costs around 200 to 1,500 rupees only, which is cost effective. Anyone wish to seek acupuncture therapy can book the appointment by clicking here. Laser therapy is performed at doctor's clinic to treat mild to moderate acne or acne scars. Laser treatment claimed best for severe cystic acne and deep acne. Laser treatment works by heating hemoglobin in the blood capillaries beneath the affected acne or scar skin, which sheds the upper layer of skin, gives new healthy glowing skin. 1. Pulsed- dye lasers (PDL). A laser emits intense monochromatic light, which has high-intensity on one and on other substance no effects of those light. Removal of blemishes through laser lights, the process called as photothermolysis. This laser treatment is also helpful to reduce future breakouts. Laser treatment is way more costly than any other acne treatments, it makes far from ideal. In terms of duration to treat acne through laser requires more than two visits(at least three visits). Not this treatment option never give 100 percent of the result. Laser treatment is preferably successful for the whiter skin as compared to darker skin. Likewise, more sensitive skin, less likely treatment to be successful. Laser treatment is not considered first-line treatment for active acne. Chemical peels are categorized into three types based on acid strength are —1. Superficial 2. Medium 3. Deep peels. Superficial peels are used for the treatment of mild acne, medium peels used for the treatment of acne and mild acne scars, and deep peels are usually only used to treat permanent acne scars and hyperpigmentation(to lighten but not completely vanish). Superficial peels are lower acids strengths than medium and deep peels. Most commonly used acids are Glycolic acid and Salicylic acids at a concentration of 10% to 30%. Superficial peels are available at the medical store as over-the-counter and at an esthetician salon. To buy Superficial or OTC chemical peel online, check here Cosmoderm Professional Chemical Peel, Rejsol Under Eye Peel, and Glycolic Acid Peel with Kojic acid. These peels are recommended by renowned dermatologists at acne.org. However, medium and deep peels could be used under the supervision of professional health care or provider. Chemical peels in treating acne are more effective in people with lighter skin tone. Whereas, people with darker skin tone before using chemical peels for treating acne first need to consult with doctors. Then proceed carefully when it comes to a chemical peel. In more sensitive case bleeding occurs. Antibiotic kills the bacteria, presents on the acne. This treatment of topical antibiotic will also depend on the cause of acne. Antibiotics prescribed by a doctor can often be an oral and topical antibiotic. 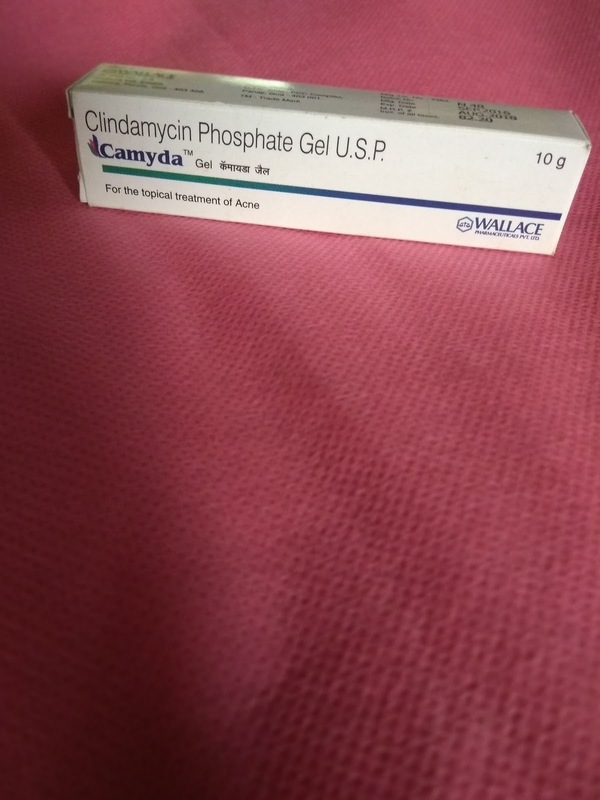 On the matter of topical antibiotics, Clindamycin and erythromycin have become popular. If you have moderate to severe acne which has not got better with topical antibiotics then doctors choose treating acne with retinoids. Commonly prescribed retinoid by doctors includes Adapalene and Tretinoin. 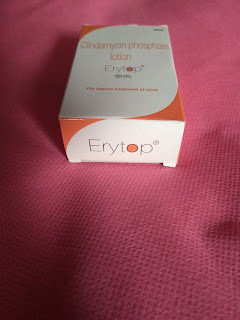 Here is the best retinoid cream prescribed by a physician and aesthetic https://amzn.to/2wXLrGV. If you considering antibiotic treatment then make sure you complete your course despite missing any dose. There are evidence antibiotic reports failure and develop resistant if continued antibiotic treatment for longer. It means bacteria become immune to the effects of antibiotic over time and antibiotic fails to kill bacteria. OTC medication can treat mild acne. 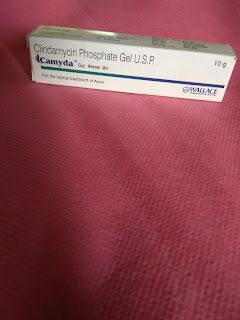 Most of OTC drug contains at least one of following ingredients. Soaps commonly prescribed by the doctors is Perobar(Benzoyl Peroxide), Cetaphil Gentle Cleansing bar, and few more. These soaps efficiently clear the skin of excess oil and germs(bacteria) without drying out your skin too much. People who have sensitive skin type, use Cetaphil face wash or Cetaphil cleansing bar. The scars from the previous acne linger on your skin, sometimes tends to get permanent. Treatment of scars is more or less related to acne treatment. When it comes to the treatment of acne, it's all about trial and error if you or your doctor couldn't find the cause of acne. Dermabrasion is the special treatment for facial skin, especially performed for the scar treatment. In dermabrasion surface layer of skin is skimmed with the help of an instrument. This is performed in the doctor's office. Dermabrasion is feasibly performed on all skin tones and texture, which is then cleaned thoroughly. Daily regimen for good skin care will be shared with you soon. Till then stay glued with Eureka Of Life. Eureka Of Life welcomes you all. This blog is made for you those who looking for healthy living, being inspired and motivated and leaning amazing facts. Wonderful blog post about acne treatments available. Very informative. Thank you so much for sharing your knowledge. Great article on acne... Please do post something on hairfall.. The Skin Tightening Treatment comes to mind when we think about tightening the skin with the great ease. Continue reading to know the cost, benefits, results, side effects, procedure, and more. I had been suffering from this problems since long and thanks to you for clearing my understanding for treatment about acne problem.. Looking ahead for more such articles. Place to unite bloggers....Promote their recent posts. Help everyone in the group for their promotions. Eureka Of Life welcomes you all. This blog is for healthy living, home made remedies, being inspired and motivated and learning amazing facts.